We're sort of keeping up our trend of spending less in most categories, although we had some big expenses this month, too. We replaced the tires on our Mazda (sorely needed, and just in time for winter!) and I entertained myself quite a bit in October - I went to a musical and got a great Groupon deal for prenatal massage. We also saw some increases in household expenses due to the projects we've been finishing up. 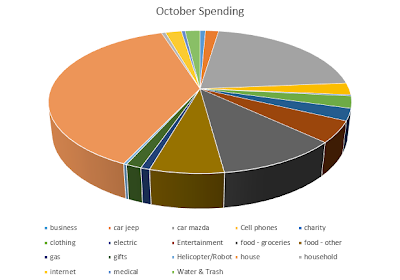 We sure are being average with our food spending though - we were only off by $2 month to month! Let's not talk about what the stock market is doing to our retirement accounts, though, eh? At least we were able to put some money into savings this month, on top of our expenses! Our retirement accounts took a massive hit last month too. I'll look at them this week for our net worth update but it's good to remember that we're in it for the long haul. How does prenatal massage work for you? I normally get deep tissue massages for my chronic pain but can't get comfortable lying down at all so haven't gotten one in a while. Last time, my "prenatal" massage actually took place a few weeks after I gave birth, and I laid on my side. It was okay but not quite as therapeutic as I normally like. This time, I did the massage at I think 31 weeks, and they had a weird pillowy thing with a hole in it that they adjusted to fit me into so that I could lay on my stomach. It was WONDERFUL. It was sort of like the softer foam mats that you would see in a gymnastics class, is the closest way I can describe it. Anyway, it worked great and I was totally comfortable. Prenatal massage techniques are a little bit different: they don't do feet until after 34 weeks, as that can trigger contractions, the therapist used less pressure when working on my back than I would normally request, and if you have problems with dizziness while laying on your back I guess you could be propped to one side. So it's not quite the same experience as getting a good, deep massage while not pregnant. But I tell you, I walked out of there with no pain for the first time in weeks. It was also the first time in weeks I was walking and not limping or waddling. It was so worth the money, and I paid for a second one before I walked out the door. Now I'm so big I'm not sure they could get me comfortable even with the donut thing, so I might wait and do it a few weeks post partum when I'm sure I could use some pampering (that's a whole different problem, with engorgement and leaking milk and all that, but at least I'd be able to be on my stomach comfortably again). Thanks! I'll have to figure out a good way to get one, I have BP problems when I lay down so it might be some weird propped up version but it might still be worth it.